Quality valve cover gaskets should be replaced regularly to prevent oil leaks. Fits 1300cc and larger Type 1 and 3 engines. Extras are always nice to have on hand! Replace your leaking main seal with a quality German component. Don't forget to change the o-ring inside the flywheel at the same time! Don't forget to install an o-ring inside your flywheel when you install it or when you replace the main seal! This is a quality unit and will not leak. Leaky push rod tubes are a common problem with vintage VW engines. A quality seal is a must. These silicone seals are a little softer than the stock ones, and comform to the tube and the bevels in the head and engine case very well, for a great seal. 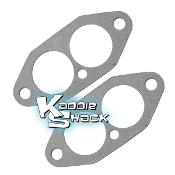 Replacement gasket for stock or aftermarket oil pump covers. 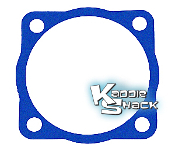 This gasket is super thin, so you won't lose oil pressure due to excessive deck height on your pump. 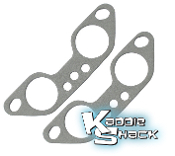 This gasket installs between your oil pump and the engine case to prevent leaks. Installs above and below the oil deflector plate. Sold each. ORDER TWO. Installs under the stand to prevent oil from sloshing up when the engine is running. 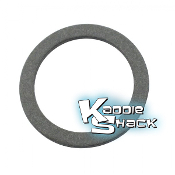 Be sure to order the top and bottom gaskets to keep it from leaking! Is the metal downspout tube wearing through where it passes though the sheetmetal to exit under the engine? This rubber seal tidies up the hole and prevents it from vibrating against the tin. 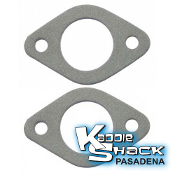 Extra thick fuel pump gasket not only keeps the pump from leaking oil, but you can stack gaskets to adjust your fuel pressure up and down. If your distributor is leaking oil where it is installed in the case, this is probably the cause. This is the little o-ring that fits into the groove where the rocker shaft mounting stud screws into the engine. Any time you remove the rocker arms, replace this o-ring to prevent oil from leaking out the back side of the cylinder head. 4 required per engine: 2 per side. 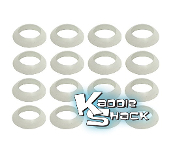 Quality replacement oil cooler seal for doghouse (1971 and later) offset oil coolers. Remember: You'll need four seals... two for the doghouse cooler, and two for the cooler adapter where it bolts to the case. Sold each. This is the oil seal that goes between the early (upright) style oil cooler and the early engine cases. Do not use this with a doghouse ('71 & later dual relief) cooler. This is the gasket that goes underneath the oil filler where it screws into the gen/alt stand. This Type 1 drain plate is made of super thick heavy duty steel. It will not warp like many of the less expensive ones. 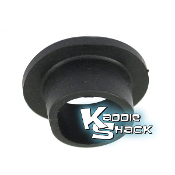 It works great on the stock case, and work well on aftermarket oil sumps, as well. Comes with drain plug and German gasket kit. Whether your drain plate is damaged, warped, or leaking on your Type 1 engine, or you're building and engine from scratch, this billet aluminum drain plate is a nice touch. 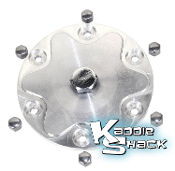 It comes with all new mounting nuts and a magnetic drain plug. This is the rubber boot (tube) for the oil filler on all Type 3 engines. It connects to the engine on the bottom and the oil filler in the body of the car where the dipstick is installed. It is common to develop cracks and leaks over the years, so check it often and replace as needed. This is the metal gasket that fits the stock carburetor on '71 to '74 dual port engines. Of course, dual port engines are much more popular in cars of every year now, this is the one you'll need if you have the stock single carburetor on your DP engine. 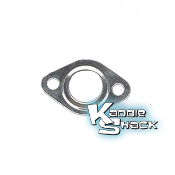 These inake gaskets fit the TYpe 4 1700cc, 1800cc, and 2000cc engines in late buses and 914's. These will fit with the stock intake manifolds or with the aftermarket dual carb intakes that we sell. Sold in pairs. 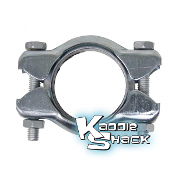 This is the crush ring that seals the intake manifold against the head in 1300, 1500, and 1600cc single port applications. These came on VW's from 1966 to 1970. 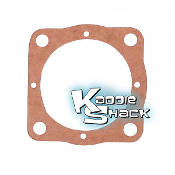 Quality replacement base gasket for your stock Solex or aftermarket VW carburetor. Base gasket set fit between carburetor and intake manifold. Fits Weber 40IDF, 44IDF, and EMPI 40HPMX and44HPMX carburetor. Set comes with two gaskets and will mount one carburetor. 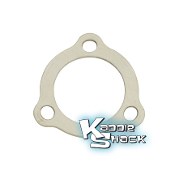 1-5/8” exhaust port gasket. 1200-1600 4pc. Premium small 3 bolt muffler installation kit with hardware. 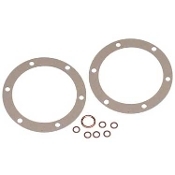 Exhaust flange gaskets, sold as a pair. Fits Sidewinder exhaust and others. 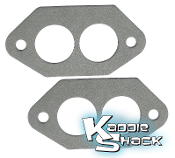 The stock OEM style metal exhaust gaskets are proven to work better than most every other aftermarket gasket in most applications. Don't risk doing the job twice. Use the right parts the first time! A common cause of exhaust leaks is a worn or damaged exhaust clamp. There is a seal inside that conforms around the flange when the bolts are tightened. It is meant to only be used once, so never try and reuse your old one! Do not overtighten. They're small bolts!